The lone game on Monday, Dec. 27, which kicks off at 5 p.m. EST, sees the Georgia Tech Yellow Jackets (6-6) meet the Air Force Falcons (8-4) in the Independence Bowl in Shreveport, Louisiana. It’s the first meeting for the programs. This is really a story of teams moving in opposite directions to meet in this game. 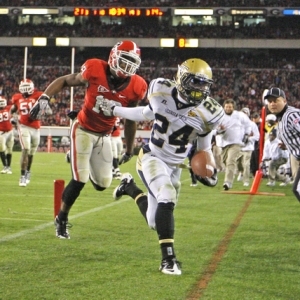 Georgia Tech played in the BCS last year, but has fallen all the way to here this time around. With just one win in their last five games they should count themselves lucky to be playing in any bowl, much less the Independence Bowl. Air Force, meanwhile, is climbing up the bowl ladder after being stuck in the Armed Forces Bowl the last three years. Georgia Tech isn’t in a good place right now, and the Ramblin’ Wreck have lost five straight bowl games. They insist that they have no motivation issues coming into this game, but given how things have gone for them -- and especially since they come into this game off a very frustrating loss to their major rivals from Georgia -- it’s hard to believe that that is entirely true. Air Force would appear to be in far better shape coming onto the game, but their record isn’t quite as impressive as it might seem. They have beaten three bowl teams this year, but two of them -- Army and BYU -- are both lucky to be there and aren’t coming off of dominant years by any means. Meanwhile, All four of their losses were to bowl teams, and those were unquestionably the four best teams they played. Georgia Tech, coming from a major conference, is a step up from much of the opposition that Air Force has faced so far, and the Falcons have not punched above their weight this year. Therefore, this game is closer than it might first appear. The game opened with Air Force favored by two points, according to college football odds, but it has settled on the key number of three. The Yellow Jackets are drawing a small majority of the bets, so the movement is a good sign that smart money has hit Air Force in this one. The total seems solid at 56. Air Force is a lousy 2-7 ATS in their last nine games, but a dramatically better 4-1 ATS in their last five nonconference contests. They are just 2-7 ATS the last nine times they have been favored by three points or less. Georgia Tech is 5-2 ATS in their last seven games as an underdog, but just 2-5 ATS in their last seven neutral site games. Eight of Air Force’s last 11 games have gone ‘under’ the total. Georgia Tech has gone ‘under’ in five of their last six. I am nervous about the motivation that Georgia Tech will have, but I still have to pick them here. The Falcons have done their best when they can surprise and confound opponents with their offense, but Georgia Tech is going to be more comfortable than most teams with what they are trying to do. I just don’t think that Air Force is big enough or fast enough to compete with top teams right now, and despite being a slumping team in an underwhelming conference Georgia Tech is still the faster, stronger, bigger team here by a fair bit. At the very least I like the chances of the Yellow Jackets to keep it close, and I don’t see a crazy high-scoring game, so having a field goal in my pocket is a nice case in here. I’m on Georgia Tech and the ‘under’.